Providence Canyon has always been a favorite of ours. The road going up is difficult enough to keep things interesting and rough and remote enough to keep it relatively quiet. There are plenty of trails in the area although many recent closures have made a negative impact on the area. The recent wet weather that we have had really greened things up. Even in July we found roads with snow drifts blocking them, one that required winching to get through. There were also a few huge drifts on the peak once we were able to reach it. It even rained a bit on us on the way up to our camp, but let off long enough to get things set up and dry out, then didn't rain at all the rest of the trip. The first morning the kids wanted to go on a hike. Providence cave is just over a mile hike from where we like to camp so we decided to head on over and check it out. The GPS Coordinates of the cave are 41*42.235N 111*41.207W and 8,527ft . The location of the trail head is 41*41.851N 111*41.604W and 8,739ft. The trail to the cave is very faint and hard to find, but it is there. Travel South towards the ridge, then down the ridge to the first clump of pines. The cave is located about in the middle of these pines just off to the North of the ridge. Unfortunately the cave was very wet this time and was impossible for us to navigate the slippery slope leading into the cave. Here are a few pics we took along the way. As you can see, the entrance still had snow in it. Just to get into the cave, I had to negotiate past this snow and under the logs in the entrance. Luckily there is a rope or I'm not sure if I would have been able to maintain my position at the entrance. The cave slopes down dramatically from the entrance, and it was slick! I tried to make a panoramic picture from a few pics I took on the way back along the trail. The lighting is off a bit, but it gives an idea of the view at least. We took the potato cannon along with us that we've made recently and launched a few taters of the nearby cliff. We quickly got bored with taters, and we had some extra time so we carved a few projectiles out of wood and launched them into the air near camp. 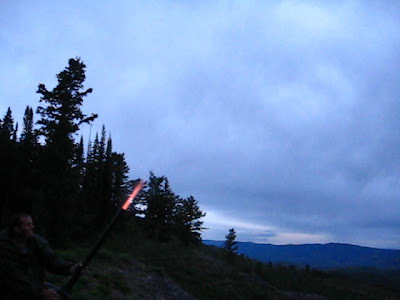 The cannon is pretty loud and can launch things quite far so a primitive camping trip on the 4th of July was a perfect time to have fun with it. The following day we drove over to another nearby trail between Providence and Millville Canyons called the Leatham Hollow Trail. This trail was awesome and a lot of fun to hike. The trail is open to dirt bikes as well as mountain bikes, and is very narrow. If smooth easy singletrack is your thing then this trail would be a great one to try. We didn't go the entire way down the trail so we don't know what the lower section is like, but the upper section was smooth with an occasional log etc. across the trail and a few short steeper climbs. It's definitely one that I'll be returning to with my dirt bike. Besides hiking on a few trails we explored many of the 4x4 roads and trails including one of our favorites up the backside of Logan Peak. There were a lot of rocks and mud so driving around was a real treat for all of us. The Leatham Hollow trailhead is most easily reached via Millville Canyon. The sign for the trail is near the top of the canyon off to the right side of the road. If you reach the steep shelf portion of road skirting Leatham Hollow you've gone to far. If you're coming from Prov then it's just past the shelf portion skirting Leatham's. Here's a few pics near camp on our last night there. The evenings were awesome, and it was a great trip. I'm guessing that the Leatham Hollow Trail goes all the way down to Blacksmith Fork Canyon, but I don't know for sure. I'm sure I'll be checking it out again sometime...the boys wanted to ride on it too, next time maybe we'll camp up Millville so we can all ride our bikes up. It would be a great mtn. bike trail too I think. Richard's Hollow is further to the North..it's a good one too. ...I actually prefer more difficult trails on a dirt bike, but combining this one with some others in the area would be a good ride. I'm not sure why you emphasize the fact that you "don't have a rig", but....OK. Sounds like you managed just fine and had a good holiday. Beautiful! Dude, you go on more trips than anyone I know. Where do you find the time? u spend alot off money for that?? Wow man! You just can not put a price to memories such as these. Your youngsters are having just the most awesome time growing up, and it seems like you're the one having the most fun! That tube car you got in the pics is quite interesting, I'm going to go hunt for some more info elsewhere on your blog.